WHAT'S REALLY IN YOUR PRE WORKOUT? In today’s oversaturated supplements market, with more and more companies flooding in, everyone does whatever they can to stay competitive and bring in huge profits. The bad news is, in mostcases,companies sacrifice their integrity and the quality of their products todo so. They create crappy products filled with artificial ingredients that don’t deliver any benefits. Even worse - they can be harmful toyour health and well-being. And because many organizations that test the quality of supplements have limited funding (a great example is the FDA in the USA), a lot of crap flies under the radar and makes money off the uneducated masses. But none of that changes the fact that a pre-workout (or any product, really) needs to cover two criteria - it needs to deliver the promised benefits, andit has to be safe to take. Today, we’ll discuss what makes a pre-workout effective, what you should look for, and how to spot and avoid the ‘money makers.’ And believe me, they are everywhere. They include the effective ingredients, but in pitiful doses, add a bunch of fillers, dyes, and low-quality sweeteners. They slap an eye-grabbing label and call it a day. This, of course, trims the manufacturing costs and increases their profit margin. But how is this possible? Remember the major loophole? Thisis it. The proprietary blend. You see, the FDA and other similar organizations require the manufacturers to list their ingredients and respective doses on the label. But if a company puts their ingredients under a proprietary blend, they don’t have to list the quantities. And I’m sure you’ve seen it - a pre-workout product that lists effective ingredients such as citrulline malate, caffeine, and beta-alanine, but without the dosages. And you, as a consumer, can only wonder what the hell you’re getting in each serving. In most cases, such products only include these ingredients for the sake of the label, but in pitiful doses, and you don’t get any benefit out of them. Sadly, this is the case for virtually every supplement out there. My advice is to avoid products that use the proprietary blend loophole in their labelsbecause there’s a good chance that what you’re getting is filler junk. Here at RariNutrition, we pride ourselves with the attention we put into our products and the quality we strive for. We understand that, before anything, our products should be safe and effective. A lot of companies out there ‘beef up’ their products with caffeine and cheap sugars to provide you with a rush of energy that inevitably leads to a crash soon after. Because of that, our pre-workout product contains no artificial dyes, flavors or sweeteners and we feel that it’s important to seek and use natural alternatives. Thanks to that, our client base can rest assured that what they are taking is safe and is going to deliver the promised benefits. Are You Getting The Most Out of Your Pre-Workout Supplement? Pre-Workouts have become one of the most popular (and profitable) product on the market. Everywhere you look, there’s a new player, offering their ‘new and improved’ product. To judge the quality of a pre-workout, there are certain things it needs to deliver and some things it shouldn’t. Energy, more endurance, and more strength. Better focus and more motivation. Energy crashes soon after your workout. These symptoms are often a good sign that the pre-workout you’ve been taking contains too much caffeine, lots of low-quality carb fillers, and not much else. With all of the cheap stimulants, fillers, and junk out there, it’s important to know which ingredients are effective and what their dose needs to be for you to gain the benefits. Caffeine is one of the best-know stimulants on the planet, and there’s a good chance that you’re consuming it through coffee or something else. If you are an avid coffee drinker, you understand how powerful of a stimulant caffeine can be. From helping you wake up and function in the morning and beating the afternoon slump, to increasing your alertness and performance in the evenings, and even allowing you to pull an all-nighter. And indeed, caffeine has been shown in numerous studies to deliver benefits such as increased energy, strength, muscle endurance, and alertness (1, 2, 3, 4). Other pronounced benefits of caffeine are improved cognitive function and memory (5, 6). As far as intake goes, even lower doses (~200 mg) have been shown to deliver benefits with fewer side effects (1). In one recent paper, the researchers wanted to revisit the recommended caffeine doses for sports performance (3–9 mg/kg of caffeine, an hour before training) (7). the current generalisedguidelines of 3–9 mg/kg, 60 min prior are clearlynot optimal for everyone. What is not clear, however, is what these guidelines should be. Until we have more research, this is what we have to work with, and everyone is free to experiment for themselves. On its own or as part of a pre-workout supplement, citrulline malate is an amino acid that has been shown to improve our performance without delivering any side effects. In one study, the researchers wanted to determine the effects of CM on bench press performance and muscle soreness following the workout (8). The subjects (41 men) had to complete two chest sessions of 16 sets each - in one session, they were givena dose of CM and placebo in the other. The researchers found that a dose of citrulline malate allowed their subjects to complete over 50% more total repetitions for the entire workout. They also found a 40% decrease in muscle soreness 24 and 48 hours after the workout compared to placebo. It’s worth noting that sixsubjects reported some stomach discomfort from the CM, which is likely due to the high dose (8 grams). In another study where high doses of citrulline malate were used, the researchers looked at the amino acid’s effect on performance, blood lactate, blood pressure, and heart rate in advanced weightlifters (9). Subjects were put in either CM or placebo group and had to perform fivesequential sets on the leg press, hack squat, and leg extension machines to failure. The result? However, subjects in the citrulline malate group performed significantly (p ≤ 0.05) higher number of repetitions during all 3exercises compared with PL group. our results suggest that citrulline malate supplementation may be beneficial in improving exercise performance during lower-body multiple-bout resistance exercise in advanced resistance-trained men. Another study found that lower doses of CM were effective inimproving aerobic energy production, allowing the subjects to perform for longer at higher intensities (10). As for dose, the upper limit is 10 grams but to gain the benefits, youcan supplement with 2-3 grams before training (11). Gram for gram, beta-alanine is just as effective as citrulline malate is and numerous studies show it. It has been shown to decrease fatigue from exercise, improve anaerobic capacity, and even increase muscle mass (though more research should be donebefore we can claim that) (12, 13, 14). From the research we have so far, it would appear that beta-alanine’ effects become pronounced past the minute mark and start to diminish past the 4-minute mark. For the majority of exercise forms out there, beta-alanine is a great way to improve performance. As far as doses go, 1.5 to 3 grams closely before exercise has been shown to be effective. L-tyrosine is an amino acid that helps in the production of catecholamines (namely dopamine and noradrenaline). The amino acid itself is metabolized to produce these hormones. Researchers hypothesized that supplementation with l-tyrosine couldprovide the building blocks needed to synthesize these catecholamines. So far, this hypothesis is just that..a hypothesis. Nonetheless, this amino acid shows promising results. L-tyrosine has been shown to decrease stress, improve cognitive performance, and reduce blood pressure (16, 17, 18). A dose of 200-500 mg before working out can deliver these benefits and improve the quality of your workouts. 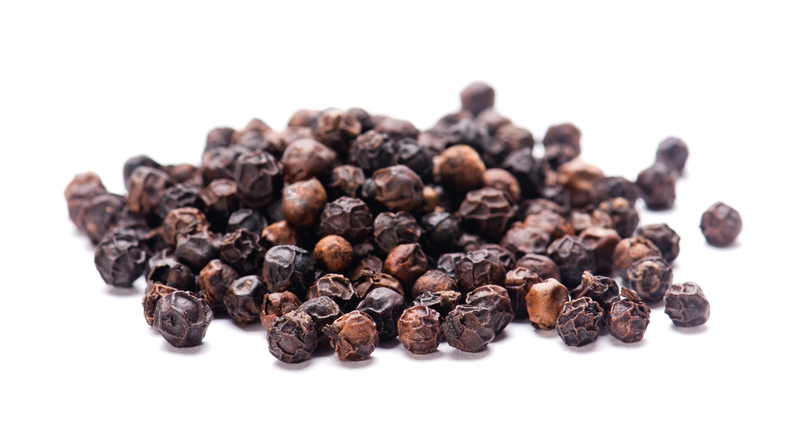 Piperine, an active ingredient found in black pepper has been shown to alter the metabolism of supplements and drugs. A neat little process in the liver called glucuronidation happens. A molecule called glucuronide attaches to a given drug or supplement, signaling for urinary excretion. A ‘bouncer’ of sorts, who doesn’talways have the best judgmentand sometimes excretes beneficial supplements that we’ve taken. Thisis where piperine comes to play and inhibits the process of excreting beneficial molecules from supplements (19, 20). In essence, when taken as part of a pre-workout, piperine (under BioPerine® on our label) allows for the body to use as much of the beneficial ingredients as possible. Unnecessary fillers, carbs, and other junk. The ingredients, proven to be effective, but hidden behind the proprietary blend. The bottom line is this: if you want to experience what a good pre-workout feels like, one that delivers a steady stream of energy without the crash afterward, and one that is dosedcorrectly, then don’t look further than Infinity. Vitamin B1 has been shown to improve skin, muscle and heart health, and to aid in food metabolism. Vitamin B2 also aids in food metabolism, improves brain health, and aids in various cellular processes. Vitamin B5 is a crucial player for energy production, though deficiencies are very rare. Vitamin B6 is involved in the production of an essential coenzyme in the body, among other things. And finally, B12. This vitamin has been shown to play an important role in neurology and taking it in conjunction with piperine important to ensure that it doesn’t get excreted from the body. Niacin is a ‘powerhouse’ vitamin and is involved in numerous biological processes including the metabolism of energy in the cells, improvement of HDL (good) cholesterol, maintenance of healthy skin, eyes, and hair, and excretion of toxins from the body (21, 22, 23, 24, 25). Folic acid is a crucial vitamin needed in the creation of new cells in the body. It’s also been linkedto good health. Furthermore, it plays a huge role during pregnancy, ensuring the proper development of the baby and the prevention of 'neural tube defects' (NTDs). If you are still reading, congratulations. You now understand why most pre-workout products out there area waste of money and what goes into one that’s effective and safe for use. With the ever-growing landscape of dietary supplements, it’s important to stay aware and educate yourself on what works, what doesn’t, what’s safe, and what can be potentially bad for your health.